Q - What's the value of my Harmony guitar ? A - If you're a buyer, the value is the max price you are ready to pay to have it. If you're a seller, the value is the minimum amount you accept to sell it.. Easy ! You can check ebay for completed sales for the same model, but value on ebay is not value in a shop or elsewhere, for reasons. Outside of a completed transaction, value has no meaning, so please do not ask me to value your guitar. Please re-read above and you'll have the answer. Harmony instruments were produced on an industrial scale. Even the less common models can't be considered "rare". Remember that all Harmony made guitars (this means all guitars on this website) are still considered low grade instruments by most players and collectors, and can't be compared in value to the "great" names as Gibson, Fender, Martin... As a result, only a handful of guys in the world are ready to pay real money for a rare Harmony model. 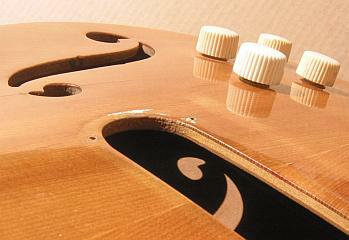 In the Harmony world, the interested buyer is often rarer than the guitar itself. Q - How can I date my Harmony guitar from the serial number ? The other smaller stamp is the date stamp and indicates the year of production. It's said that the letter at the beginning indicates the period of the year, like "F" for "Fall" or "S" for "Spring". That was before Ed, a former worker from the Harmony factory, said : "The company closed down production every July for two weeks. During the last two weeks of June an effort was made to finish as many orders as possible and not start any new orders. The last days of June, we had a complete inventory. I believe the "F'" and "S" may have stood for first and second half of the year." Photo below : this flat top guitar is from 1957. 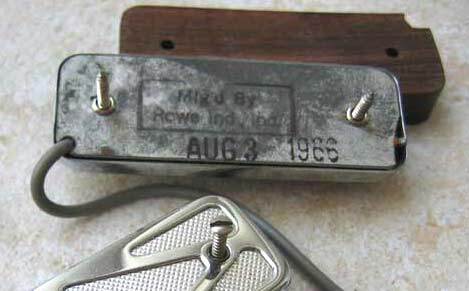 There is some variation in theses date stamps, (in an oval box on some pre-war models), but usually all guitars had one. Sometimes it's difficult to see or read. On electric guitars with "DeArmond" pickups, you should be able to find a precise date stamped on the back of the pickups, or on the back of the pickguard (some screws to remove). 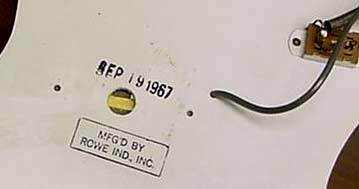 These are supposedly the manufacture date of the electrical harness or pickguard assembly, by Rowe Industries, but should give a close guess to the year of production of the guitar itself. Q - I have a Harmony Rocket that is labeled as a H56. However, it seems to be a H54. All pictures that we have seen have identified it as a H54. Its very weird and I'm wondering if there was ever any rumors of misprints in the serial numbers. ? A - Yes, it's definitely not rare to see "misprints" serial stamps inside Harmony guitars, between similar models. They were made on the same assembly line at the factory, and of course the body was the same before routing the holes. Misprints are especially common for popular models, as the Rocket electrics (H53/H54/H56/H59), or the Archtone acouctic archtops (H1213/H1214/H1215). I even checked a couple of guitars with double date stamps, one was stamped 1961 and 1963. Either they re-used a back prepared for the previous batch, two years before on the line, or they mistakenly used a 1961 stamp in 1963. It looks like Harmony serial and date stamps were meant to manage the different parts and instruments on the production line, not to be used as reference by collectors 50 years later... Keep this in mind when identifying ! Q - My brother has a Harmony Meteor in great shape but the the serial number is 84H8448. From what I have gathered on your site this indicates that it is an Airline. The Harmony Meteor label is on the head stock. The other stamp reads HL-59-JW. Do you think someone added the Meteor Label on the Headstock? or is this a Meteor ? 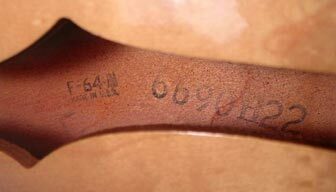 A - These stamped numbers inside Harmony made guitars were not intended as real serial numbers. They were used to keep together various parts of the same guitar on the assembly line. As they were building similar models on the same line at the same time, we often see this kind of glitches between the model and the stamped number. In other words, if this guitar looks like a Meteor H70, it's a Meteor H70, no matter what's the stamped number inside. Q - Is my Harmony guitar made from solid woods or laminated ? 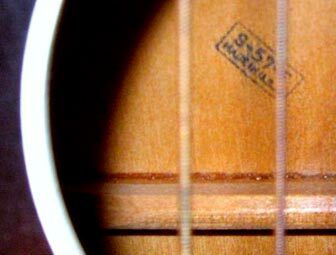 A - If your guitar is an acoustic, please read this and tell everyone about it : ALL Harmony acoustics were made from solid woods, even the lowest of the lower grade student model, made from solid birch. Ok, there is some rare exceptions to this rule, for some very late models produced a couple of years before the close of the factory in 1976. Kay was known for mastering the laminated techniques, Harmony for using only solid wooods. - If your guitar is an electric, most models produced after 1960 (and all cutaway) have a laminated top and/or body. 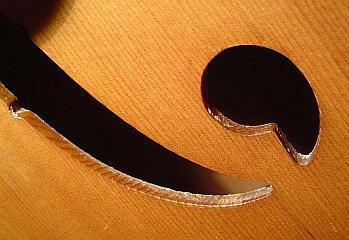 Older "full box" archtops designed from acoustic models still were made from solid woods. An exception to those rules is the late H68 "Artist", built from acoustic H1310 bodies, all solid. Q - Where can I buy parts for my Harmony restoration ? A - No known professional is specialized in Harmony parts only. Ebay auction site is the main provider for rare parts, but you need to monitor the offers each day... Some ebay sellers are known for Harmony parts. 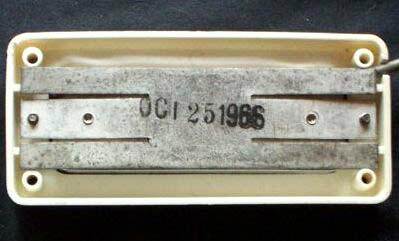 You can check "tom69442" for repro pickguards, and "Harmony12X5" for some parts. For generic guitar parts and tools, well-known web sites include Stewmac and Allparts. A more efficient way would be to register and ask to the Harmony discussion board. Please do not contact me about parts, I'm not a seller. Q - My guitar has only 4 strings ! A - So it's a tenor guitar ! You can visit www.tenorguitar.com to learn more about tenor guitars. They are supposed to be tuned CGDA and have a shorter 23" scale (length of strings). Check the tenor family here in the database to see many Harmony made tenor guitars. If your "guitar" is smaller, perhaps it's a ukulele ! The ukuleles have 4 nylon strings, and are available in different sizes. The smaller size is the soprano (21" long), then you have the concert, tenor, and baritone larger sizes. The baritone ukulele is sometimes confused with a tenor guitar. The baritone ukulele has a 21"3/8 scale, shorter than the 23" of a tenor guitar. Harmony baritone ukes are about 30" long. Q - I can't find my Harmony guitar on your site, why ? A - Because this site will never be complete, I'm afraid. Please use the contact form and tell me about your model. I will reply, and if you have some pictures I will gladly add them to the site. But if your guitar has a Harmony logo with the added words "est 1892" (or "since 1892"), it's an Asian made Harmony, built after 1975 when Harmony closed his Chicago factory. This site is mainly dedicated to USA-made Harmony's, but there is now a special section for some Asian made Harmony guitars.